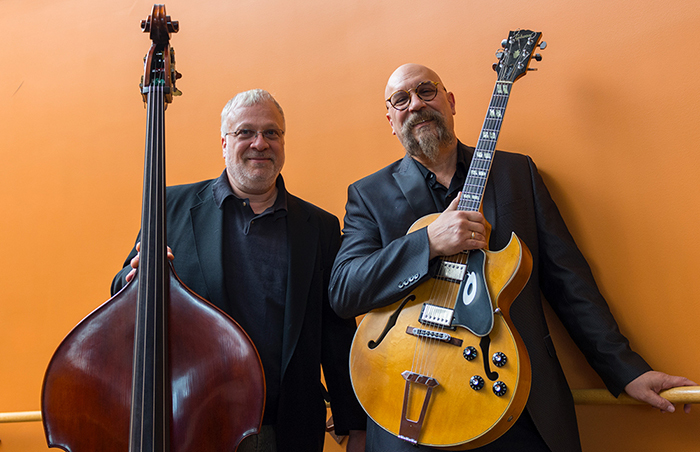 Capital District Jazz is excited to announce the next event in its monthly concert series Jazz at the Spring, a CD release concert featuring guitarist Michael Musillami and bassist Rich Syracuse, who are at the peak of their game on their latest recording Bird Calls. Bold, inventive and fearless this adventurous pair tackles the iconic music of Charles Mingus and the result is pure joy! These two master musicians converse freely in the language of jazz improvisation, Musillami notes, “we used the elements in his (Mingus’) music; melody, harmony, and rhythmic figures to create something that is our personal statement." Downbeat magazine, in its four-star review attests to the Musillami-Syracuse magic, “Musillami and Syracuse approach their chosen source material with respect and thoughtfulness, but they’re also eager to take chances. Musillami uses his nuanced touch, pearly sound, tuneful instincts and rhythmic musicality to fine effect, matched by responsive bassist Rich Syracuse.” CDJ invites you on Thursday February 22, to celebrate the music of Charles Mingus, and the release of Bird Calls. Born and raised in California, Michael Musillami studied with renowned guitarist Joe Diorio before moving to the east coast in the early 1980s, working primarily in organ trios led by Richard "Groove" Holmes and Bobby Buster, among others. In addition to paying his dues by sharing the stage with Junior Cook, Dewey Redman, and Curtis Fuller, Musillami became part of the circle of musicians connected to the Hillside Club in Waterbury, CT, throughout the 1980s. Over his 30-year career, Musillami has led a variety of ensembles, releasing 19 CDs and touring throughout North America, Canada and Europe. Along with his longstanding flagship trio with bassist Joe Fonda and drummer George Schuller, he has earned critical notice as the leader of groups ranging from duo to octet, featuring such prominent collaborators as Mark Feldman, Cameron Brown, Drew Gress, Michael Sarin, and Matt Wilson. In 1999, Musillami founded Playscape Recordings to give himself more control over his recording career and support other musicians. Built around a cadre of frequent collaborators, the label has garnered extensive critical praise and a catalog of more than 70 diverse releases. "Like Blue Note or CTI in their prime," writes Signal to Noise reviewer John Chacona, "Michael Musillami's Playscape label has a signature sound." When not working with his own bands or managing his record label, he also teaches at The Hotchkiss School in Lakeville, Connecticut. Learn more at www. michaelmusillami.com and www.playscape-recordings.com. Rich Syracuse has been a mainstay in the New York area scene for more than three decades. At an early age, Rich started performing at many New York City venues. During these early years he was the winner of the prestigious "Congress of Strings" award. He later went on to receive a Bachelor of Music degree from Manhattan School of Music in New York City. In the 1970's Rich performed with The Group for Contemporary Music under the conductors Charles Wournin and Harvey Solberger. During these early years, Rich performed extensively with The Hartford Ballet and the New Jersey Lyric Opera Company. Rich also performed with numerous jazz groups which included pianists John Mehegan, Joey Calderazzo, and Ted Rosenthal. In the mid 1980's Rich began a long-standing position as bassist in the Nick Brignola Quartet playing at numerous clubs, festivals, and participating in many recording sessions. In addition to his years with Brignola, Rich has also performed with Mose Allison, Kurt Elling, Dave Liebman, Brubeck Brothers, Warren Bernhardt, Sumi Tonoka, David Torn, Mike DeMicco, Peter Levin, Sam Morrison, Bernard Purdy, Jeff "Siege" Siegel, Dena DeRose, John Medeski, Michael Musilliami and Ali Demogli. For over 22 years, Rich was bassist for pianist Lee Shaw. Rich has for many years been touring throughout Europe, South America, and Southern Africa. Rich Syracuse is the Professor for String and Electric Bass Studies at Skidmore College in Saratoga, New York. He also teaches at SUNY New Paltz, Hotchkiss School in Lakeville Connecticut, and the Millbrook School in Millbrook New York. He is an Individual member of the International Association Schools of Jazz. © 2018 Capital District Jazz Ltd.